Two portraits shown side by side. 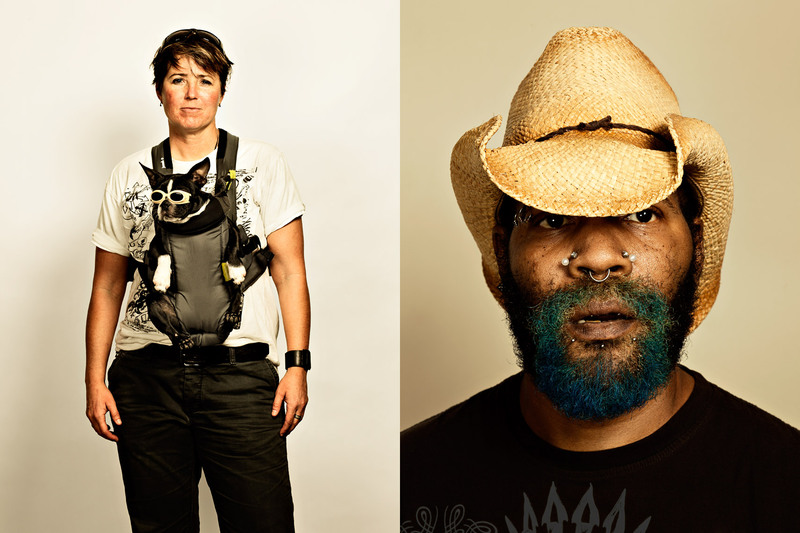 Both photographs are shot in a studio style, on a white background, but on location at Atlanta street festival EAV Strut. One photograph is of a middle aged woman with a dog, probably a French Bulldog, wearing dog sunglasses, or Doggles, in a Baby Bjorn baby pack. The other is of an African American man, wearing a cowboy hat and with a blue painted beard and multiple facial piercings, photographed headshot style. Both photographs made by Atlanta based location portrait photographer Nick Burchell.